ATHENS, GREECE - Webster University’s Athens campus as of August 22, 2016 has been accredited/licensed by the Ministry of Education, Research and Religious Affairs of the Hellenic Republic. The Greek government approval will allow Webster University to expand current programs at its fully owned and controlled, accredited campus in Athens, Greece and broaden the type of students at the location. Until then, the Athens campus was only accepting study-abroad students from other Webster campuses, Webster International Network Schools and Odyssey in Athens partners. Greek students and students from other countries will now be able to study at Webster Athens and earn Webster University degrees. Besides the Greek government recognition, Webster Athens is accredited by Higher Learning Commission (HLC). HLC is recognized by the US Council for Higher Education (CHEA) and the US Department of Education. Further, prestigious accrediting bodies in their respective fields accredit specific programs of the university. The Athens Campus has quickly grown to be a very popular study-abroad destination within Webster’s network and is located at the historic district of Plaka at the foothill of the Acropolis. 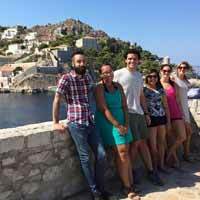 Excursions throughout Greece are an integral part of the study abroad program. Webster University currently offers 20 undergraduate and 5 graduate degree programs at its Athens Campus. For more information about the degree offerings and/or a full listing of classes, visit http://www.webster.edu/study-abroad/programs/greece/ or email Dr. Peggy Manouka, Director of Admissions, peggymanouka91@webster.edu.